The sailing capital of the Caribbean is also a prime destination for divers. Below the island's green hills and white sand beaches lie volcanic slopes encrusted in hard corals and festooned with undulating groves of colorful sea fans and sponges. Currents are mild, fish life abundant and the logistics are easy. Laid-back beach resorts launch boat trips to local reefs, or visits to one of the Caribbean's most storied wrecks: the RMS Rhone. A liveaboard option combines sailing and diving on an island-hopping itinerary, while a no-anchor policy protects prime sites. Surface intervals are livened up by iconic beach bars that encourage a barefoot and fancy-free approach to life. The volcanic high points that form the islands of the British Virgins are parts of a broader subsea plateau. Dives sites are accessed by boat and generally conducted along island slopes or along submerged pinnacles, which drop to maximum depths of 80 to 90 feet and level out into an expansive sand seafloor. These topographies accommodate divers of varying experience and interests, who can stay shallow or move deeper. Sites in the southern islands are suitable for all, while northern sites offer additional rewards for intermediate to advanced divers. Water temperatures range from 78 to 83 degrees. The wreck of the RMS Rhone deserves two dives—one to explore the deeper and more intact bow, a second shallower dive to investigate the scattered remains of the stern. Take time to peek under and inside the various bits of wreckage, which often harbor small marine life. The RMS Rhone should be on any diver's list. Ginger Steps and Alice in Wonderland deliver hard coral gardens and slopes facing blue water. Seal Dog Rocks is one of the fishiest sites, Flintstones amazes with huge boulders and undersea pinnacles such as The Visibles combine reef life with chance visits from sharks and eagle rays. A skin suit or shortie is ideal in summer, switching to a 3mm full suit in winter. Trade winds can be refreshing, but also accelerate evaporative cooling during surface intervals, so include a post-dive cover up. The name Cuan Law reflects owners and designers, Duncan and Annie Muirhead's Scottish heritage. "Cuan" is the Scottish-Gaelic word for ocean and "Law" means mountain. Cuan Law with her towering white sails appears to be a snowy mountaintop rising from the ocean. The Cuan Law was built in Canada and is one of the world's largest sailing trimarans, built for cruising. The British Virgin Islands include a dozen major islands and another 50-plus smaller and uninhabited islands and exposed rock formations. These islands line up in two roughly parallel east-to-west lines, separated by the four-mile-wide Sir Francis Drake Channel, with the easternmost island of Virgin Gorda sheltering the chain from ocean swells generated by seasonal trade winds. The British Virgins are volcanic in origin, resulting in underwater landscapes that tend toward coral-encrusted ledges and slopes rather than fringing reefs. The exception is the remote island of Anegada, which is a low limestone formation flanked by an extensive barrier reef. Because these islands are relatively small, and dry through much of the year, there are no rivers to create viability-robbing runoff. Dive sites tend to start shallow and run to depths of 80 to 90 feet, which is the average depth of the broad plateau that sits below the entire island chain. The waters of the BVI are protected by the National Parks Trust, with no harvesting or anchoring allowed, and mooring buoys provided at all sites. As a result of these protections, the waters hold an abundance and variety of marine life, including groupers, snapper, tarpon, jacks and a wealth of blennies, eels and invertebrates. Many sites sit close to an island, where coves and promontories block prevailing easterly trade winds. Ledges are common features, and these sheltering undercuts hold nurse sharks, eels and lobster. Some sites also feature large submerged rock formations and boulder piles—another legacy of volcanic origins. Here, divers will find crevices, canyons and swim-throughs that shelter marine life and add variety to the profile. A majority of dive operators are based on the primary island of Tortola but there are also dive operators on Virgin Gorda and several smaller islands. 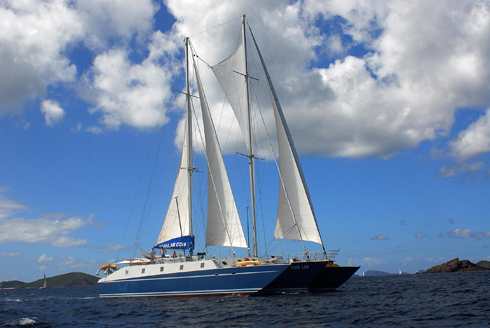 A sailing liveaboard, the Cuan Law, has operated in the British Virgins for years, providing access to sites across the archipelago. The most famous dive site in the region is undoubtedly the wreck of the RMS Rhone. This 310-foot iron-hulled steamer floundered and sank off the coast of Salt Island in an 1867 hurricane. Some 150 years later, the bow of the wreck remains largely intact at a depth of 80 feet, and divers can swim through a shadowy interior that was featured in the classic film The Deep. Another significant wreck, the 246-foot Chikuzen sits in open water seven miles north of Tortola, intact and lying on its port side. This wreck attracts huge aggregations of schooling fish, as well as passing sharks, turtles and rays. Stronger currents and a more exposed location make this an advanced dive, and it is most often visited in summer months. More consistent conditions are found at Wreck Alley, where four tugboats sit upright on a sand bottom. Prolific hard coral formations include sites such as Alice in Wonderland, where an expansive field of mushroom corals dominates the slope. Points, ledges and pinnacles feature prominently at many sites. At Cistern Point, tarpon gather on a rocky projection above a grass bed that attracts hawksbill and green turtles, while Vanishing Rock is swarmed by sergeant majors and schooling jacks. Sites to the north include grottoes, clefts, caverns and swim-through arches. At Flintstones, divers might imagine themselves in the cartoon town of Bedrock as they make their way through a field of house-sized boulders. Cow's Mouth offers a labyrinth of swim throughs and hidden grottoes, and at West Dogs divers can swim right through the center of the island in the shallow grotto known as Joe's Cave. Entry Requirements: All U.S. citizens are required to present a passport with one blank page for entry stamp. No visa is required. Exit Requirements: Upon departure from the British Virgin Islands, there is a Government Departure Tax of approximately $20.00 US when departing by air. No vaccinations are required for entry into the British Virgin Islands. It is recommended you check with your doctor and the Centers for Disease Control on recommended vaccinations for travel at cdc.org. Don't expect clipped English accents when you land in the BVI. Though this island group remains a British Overseas Territory, its heritage includes Dutch, French, Spanish, Danish and African influences, along with a healthy dose of pirate lore. Blackbeard, Bluebeard and Sir Francis Drake plundered from island bases in the archipelago, and Norman Island inspired Robert Louis Stevenson's novel Treasure Island. Real-life pirate booty is claimed to still remain in hidden caves near the Bight. The same coves and harbors that once sheltered buccaneers are now filled with the Caribbean's largest collection of sailing yachts. Steady trade winds and easy line-of-sight passages between islands make the British Virgins an epicenter for bareboat sailing. It's not what it sounds like. Though uninhibited crews may actually shed clothing from time to time, bareboating actually refers to charter yachts that are sailed without the aid of professional captains and crew—the nautical equivalent of a rental car. With hundreds of these boats based in the BVI, there is a willing clientele for the numerous beach bars that line island shores. Iconic favorites include Bomba's Surfside Shack, Foxy's, The Soggy Dollar Bar and the schooner turned bar known as the Willie T.
Electricity in St. Vincent is 110/220volts, 60 cycles, so U.S. appliances and electronics do not need an adapter. The area code/country code for the British Virgin Islands is 284. Check with your service provider for long distance/roaming information and costs. WiFi is available at most resorts and some restaurants and bars. The water is safe to drink at most hotels, restaurants & bars. If you are staying in a villa, be sure to ask about the water supply. Bottled water is available in stores and restaurants. English is the official language. The local currency is the U.S. Dollar. The British Virgin Islands are in the Atlantic Time Zone (AST) and they do not observe Daylight Savings Time. The BVIs are 4 hours behind Greenwich Mean Time (-4 GMT). The British Virgin Islands are made up of 4 larger islands and 50 smaller islands. They are a British overseas territory located in the Caribbean, East of Puerto Rico. They cover approximately 58 square miles. The capital of the BVI's is Road Town, located on Tortola. Tortola is the largest island approximately 12 miles long and 3 miles wide. The population of the British Virgin Islands is 30,659 (2016).